Never completed owing to the Wars of the Roses, Eton College Chapel should have been a little over double its current length (a plaque on a building opposite the west end marks the point it should have reached) and, in common with its beginnings, is a space which has seen considerable change over the years. Its late fifteenth-century wall paintings are the finest surviving examples in northern Europe and, painted in monochrome (grisaille), depict scenes from the Miracles of the Virgin separated by standing figures of saints. Yet these were hidden for the best part of three hundred years – whitewashed over by the College barber in 1560 – as a result of an order from the new Protestant church authorities banning pictures of fictitious miracles. Rediscovered in 1847, they were finally cleaned and restored in 1923. A bomb that fell on Upper School in 1940 shattered all the Chapel glass except that in the window above the organ. 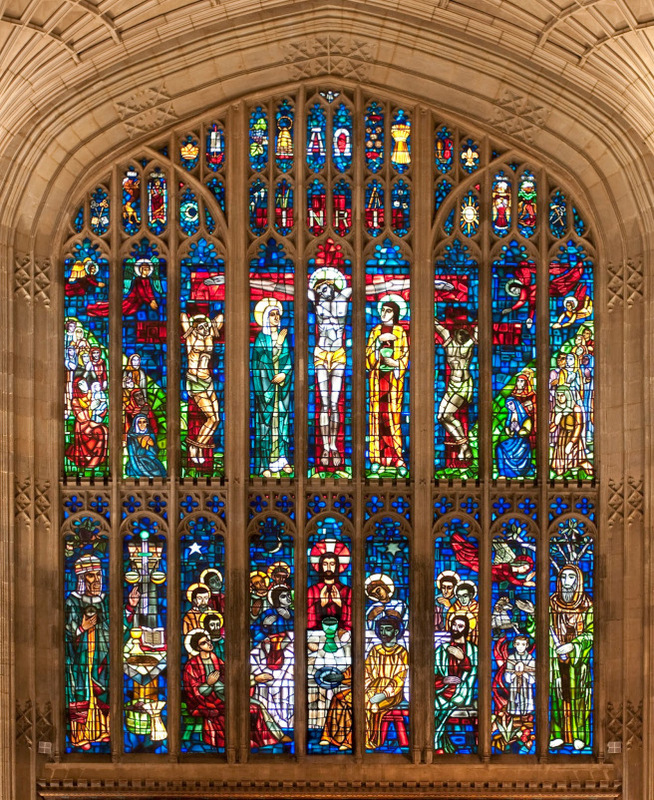 The east window, which was created by Evie Hone and installed in 1952 as a replacement, is considered by many to be one of the masterpieces of modern stained-glass art. 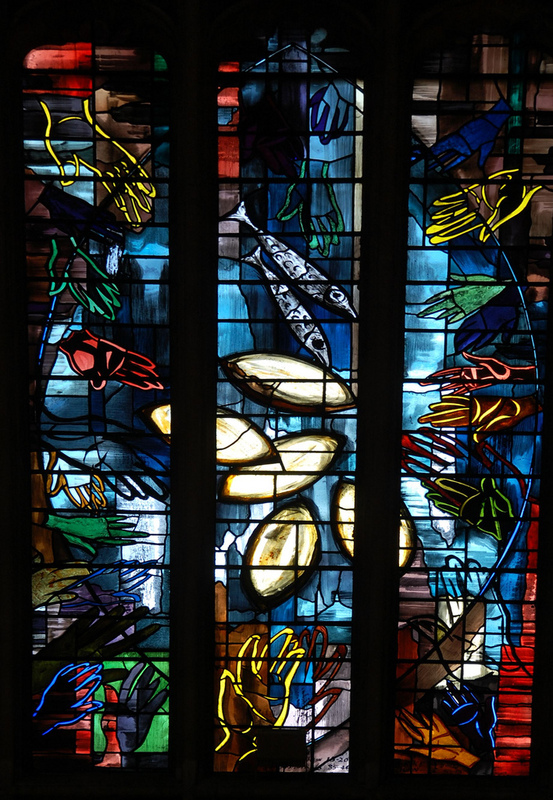 The designs for the windows flanking it, four on each side, are by John Piper and were executed in glass by Patrick Reyntiens from 1959 onwards. The subjects are divided into four miracles on the north side and four parables on the south, each built around a general theme of success and failure. In Hone’s work, this painterly sensibility derived from the dual influences of Albert Gleizes and Georges Rouault. Despite his influence on Jacques Maritain and the ideas Maritain developed in Art and Scholasticism, the work of Georges Rouault had not been well received by the Roman Catholic Church, and until 1950, when five windows based on his designs were included among the many artworks commissioned through Père Couturier for Notre-Dame-de-Toute-Grâce at Assy, he received no church commissions. One incident demonstrating the continuing controversy caused by his work concerned a painting Christ in His Passion, which was presented to the Municipal Gallery of Modern Art in Dublin in 1942 by the Friends of the National Collections of Ireland but rejected on the grounds that it was “offensive to Christian sentiment,” despite its creator being widely recognised as the foremost Catholic artist of the twentieth century. Evie Hone was among those who defended Rouault’s work in this controversy. In the stained glass that she increasingly produced from the 1930s onwards, Hone has been said to have passed from the influence of Albert Gleizes, her teacher of many years, to “the rugged, emotional, representational style of Rouault’s paintings” (Bruce Arnold, Mainie Jellett and the Modern Movement in Ireland). However, what Hone and her close friend Mainie Jellett (both students of Gleizes) appreciated about the work of Rouault involved continuity with the teachings of Gleizes. Jellett spoke of the “harmonic quality of colour” in Rouault’s work with his use of “velvety black lines” (often compared to the lead lines of stained glass) which are “used to emphasise the rhythm of the form.” She perceived “a close link with primitive Christian art and Celtic Christian art,” a link which was also of importance to Hone, who had, on other occasions, related “her sense of rhythm and colour to her Irish Celtic roots” (Bruce Adams, Rustic Cubism). Hone’s design for the window takes a layered approach, with a lower-tier Last Supper scene flanked by the sacrifices of Melchizedek and Abraham below an upper-tier Crucifixion scene flanked by worshippers on the surrounding hillsides, and finally a sequence of ten Christian symbols. While each band of images is complete in itself, the lower tier precedes the upper tier visually and within the narrative. This design provides a sense of structure and order, conveying a sense of stillness and peace despite the strength of colour and emotion contained within. The centre for this expression of emotive colour is the Crucifixion scene, which revisits that found at St Mary’s Downe. The window at Downe was installed in 1950 and has three lights containing the crucified Christ, Mary and St John with related symbols above, as here. Its effect at Downe is quite different, however. There the image dominates the church as the primary focus within a smaller space, and, being closer and larger to the viewer, the emotive power of its colour and design is more apparent. Here, the image is within a larger scheme and at a greater remove, reducing the visceral emotive impact but enhancing a sense of story through sequencing that is both immediate (the Passion narrative) and that also links to past and future (the Old Testament images in the lower tier and the Revelation-linked images of worshippers in the upper tier). Piper and Reyntiens had considerable opportunity to study Hone’s design as they were commissioned to create eight windows in the Chapel, the subjects being The Miraculous Draft of Fishes, The Feeding of the Five Thousand, The Stilling of the Waters, The Raising of Lazarus, The Light Under a Bushel, The House Built on the Rock, The Lost Sheep, and The Sower. In the design of their own windows, they made a number of clever and sensitive connections to the east window. The deep reds and blues of their first two windows mirror the colours that predominate in the Hone window. As noted, the Hone window is designed with an early and concluding scene from the narrative. Piper and Reyntiens structure their windows in the same way. So, in The Light Under a Bushel, we have, below, the light hidden, and above, the light revealed; in The House Built on the Rock, the scene below is the house which was destroyed, while above is the house that stood firm. This pattern continues throughout the sequence of parables and miracles. As there is no Resurrection image at the east end of the Chapel (the tapestry below the window depicting the Nativity), Piper and Reyntiens begin their sequence of miracles with The Raising of Lazarus. Each of their miracle and parable windows are also paired across the nave. So, light hidden and revealed in The Light Under a Bushel is contrasted with death and resurrection in The Raising of Lazarus; The Stilling of the Waters is linked with The House on the Rock; The Lost Sheep with The Feeding of the Five Thousand (the significance of the few rather than the many); and The Sower with The Miraculous Draft of Fishes (scarcity and abundance). The first image is reproduced by permission of the Provost and Fellows of Eton College.